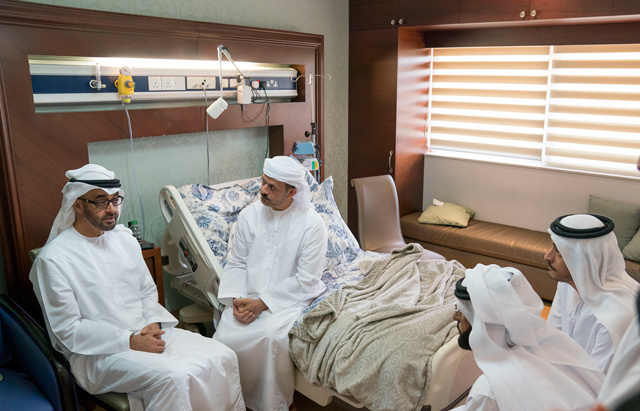 His Highness Sheikh Mohamed bin Zayed Al Nahyan, Crown Prince of Abu Dhabi and Deputy Supreme Commander of the UAE Armed Forces, today visited Brigadier Khalifa Mohammed Al Khaili, Director of the Traffic and Patrols Department at the Abu Dhabi Police, at Zayed Military Hospital, to check on his condition after he suffered from a traffic accident. His Highness Sheikh Mohamed bin Zayed gave his best regards to Brigadier Al Khaili while wishing him a quick recovery. Brigadier Al Khaili offered his gratitude to His Highness Sheikh Mohamed for his support and visit, highlighting the support of the wise leadership for the nation’s citizens and their mutual closeness and solidarity. His Highness was accompanied during his visit by Mohammed Mubarak Al Mazrouei, Under-Secretary of the Abu Dhabi Crown Prince's Court.